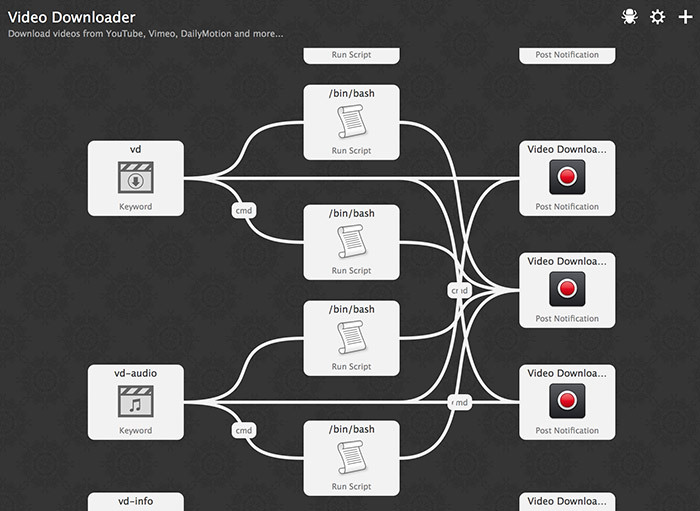 This is a workflow for easily downloading videos (and/or extracting audio) from various websites such as YouTube, Vimeo, DailyMotion and more... It uses youtube-dl as the core component. 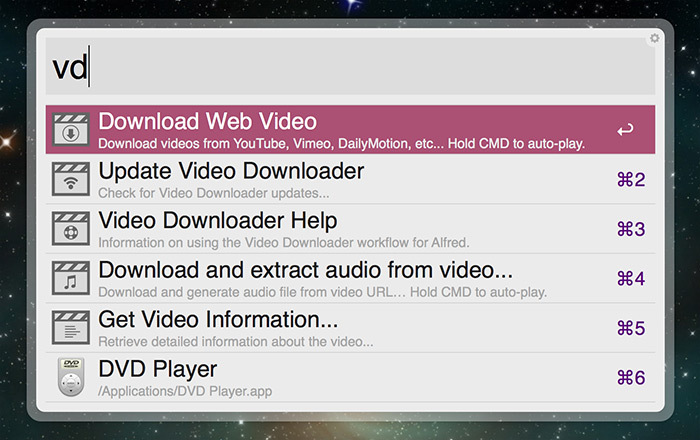 Note: vd-update command currently only updates youtube-dl, not the workflow itself. Please see full details, updates (and source) of the project at GitHub. For the audio extraction (vd-audio) feature to work, you should install FFmpeg yourself manually (because of licensing issues). If you don't have it already; you can find details on how to install FFmpeg at the GitHub page. Great work! But why don't you automatic retrieve the url from the open browser window!? Never the less, its really nice! I didn't have time for that. Maybe in the next version.. or anyone can improve it on GitHub. Is the workflow looking in a different spot for ffmpeg? echo "Make sure you've entered a valid video URL or parameter. Otherwise, try updating or re-installing Video Downloader." Did you run vd-update in Alfred after install? What do you get when you run which ffmpeg in terminal? I can't seem to install it in /opt/local/bin/ but I don't understand why it needs to specifically be there. How did you manage to install it into the different location? I think it needs to be there because the WF expects it. I didn't do anything special. Just re-installed it. Sorry, not much help. Hmmm ok thanks, I'll try reinstalling it. How did you install it, did you use homebrew or something else? Wait so you installed it in exactly the same way and it moved to a different folder? No, got smart and used Homebrew the second time. but no matter how I edit the vd.sh script, it's always failing. I'm not very familiar with the intricacies of bash scripting, can anyone help?